My son and I were discussing geneology and he asked me if Hoffman is a Jewish name or not. I explained that it was one of those names that could be either Jewish or German. 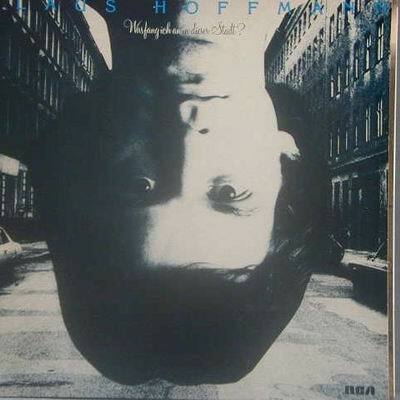 His question jogged my memory of a singer from Berlin named Klaus Hoffmann. When I was back in my 20's, my father and I used to drink Ballantine Ale together and listen to his music. At a time in our lives when we differed about so many things, our musical tastes overlapped. Hoffmann sings in regular High German and some songs in Berlin slang, which brought back memories for my father. One song, the Kreuzberger Waltz had some lyrics that dealt with playing tennis over the Berlin Wall every Sunday. The lyrics went as follows. I heard this song in 1978. Hoffmann, who was born in 1951 has been singing and acting since the late 60's, and came out with his first album in 1974. When I heart about his song about playing tennis over the Berlin Wall, it was a wild, insane fantasy. When the Berlin Wall came down in 1989, it upstaged Klaus Hoffmann's song in a way that must have delighted him. Hoffmann ranges in style from introspective such as his song "Novembermorgen" to angry and satirical, such as in his song "Nein". There is one line from Hoffmann that has many times rescued me from deep sadness. "Hol mir die Kraft aus Sommertagen und leb' in November davon. "Take for me the power from summer days and live from that in November". Next time my son stops by with his family, I think I 'll play him some of these songs my father and I used to enjoy together.